Bower House is a Palladian mansion built in 1729 to the design of Henry Flitcroft. 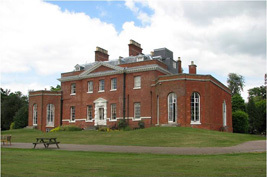 Originally named Monthavering, the mansion incorporated architectural items salvaged from the ruined Havering Palace, nearby. Bower House remained a private home until 1976 when it was taken over by the Ford Motor Company as a training centre. It is now a residential training centre operated by the Amana Trust a Christian charity. The exterior joinery was in need of repair, some of the windows and french doors having rotten timber and loose joints. The sliding sashes were loose in their frames and need a thorough overhaul to bring them back into correct operation and help prevent draughts. William Martin carried out a thorough survey of each window and specified the necessary remedial works, including associated repairs to the brickwork, guttering, downpipes and leadwork.